The HTC One is easily one of the most important devices HTC has ever released as it tries to regain its profitable positions and return it to positive dynamics, and now the One handset to help it achieve those goals has finally become official. The HTC One brings big improvements in four key areas - camera quality with a new BSI camera with optical image stabilization and UltraPixel technology, a premium metal unibody design, a new simplified HTC Sense Android experience and enhanced stereo sound. 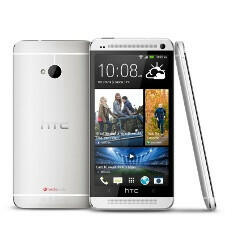 The HTC One comes with a brand new design, one that reminds us the HTC Droid DNA and the iPhone 5 of course. Dominated by a 4.7-inch 1080p full HD Super LCD3 display protected by Gorilla Glass 2 and with a pixel density of the whopping 468ppi, it features two speakers for stereo sound on the front. Overall, it looks premium all-around with an aluminum unibody crafted with what would instantly remind you of Apple - starting from the material and down to the two distinct strips where the speakers are located and the rounded chamfered edges. Looking at it, we’re wondering whether Apple is not already gearing up for another lawsuit. On the inside, the HTC one is running Android 4.1.2 Jelly Bean with a brand new and simplified HTC Sense skin. It stands out with the BlinkFeed feature, a home panel filled with large tiles of your latest updates from social networks and apps. Additionally, HTC has baked in Sense TV turning your HTC One into a TV remote (using an infrared blaster built in the power button). The Sense TV feature also acts as an interactive program guide. The HTC One is one of the first devices featuring the Qualcomm Snapdragon 600 with a quad-core 1.7GHz Krait 300 processor. 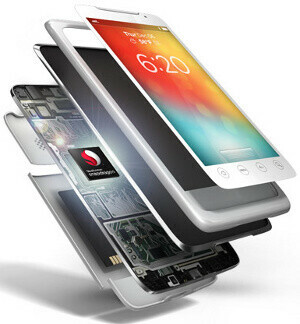 The chip also known as the APQ8064T is the 2013 successor to the Snapdragon S4 Pro, and compared to it, the Snapdragon 600 is expected to improve performance by up to 40%. The Snapdragon 600 has actually already been confirmed to be in the LG Optimus G Pro, and we expect it to arrive in many more devices in the second quarter of the year. The handset also features Adreno 320 graphics and 2GB of RAM, a powerful combination that will help for smooth rendering of the millions of pixels on the 4.7-inch 1080p display. The HTC One comes in two versions with plentiful storage, one of 32GB capacty and a 64GB one. There is no microSD card slot to further expand on-board storage. In terms of connectivity, the HTC One, of course, supports 4G LTE, but it also has an NFC chip and Bluetooth 4.0, along with the standard Wi-Fi a/ac/b/g/n and GPS with Glonass. Probably the biggest innovation in the HTC One however we saved for last - the HTC UltraPixel Camera. HTC does not name the official megapixel count, but what matters is not the pixels here, it is how HTC is using them. With ultrapixels HTC dares put an end to the megapixel race and instead to the sensible thing of increasing pixel size, and thus the amount of captured light. The end result is drastically better low-light images as the new and larger ⅓” image sensor captures 300% more light than previously possible with conventional smartphone cameras. 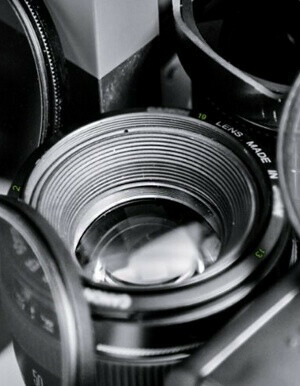 The sensor itself is a 4-megapixel backside-illuminated (BSI) with f/2.0 aperture and a 28mm wide-angle lens. The camera is also relying on a new dedicated HTC ImageChip 2 for fast image processing. Additionally, HTC is bringing a ton of little tweaks to the camera with new features HTC Zoe that creates 3-second animated short clips making your memories come alive. Finally, sound is also given a boot with HTC BoomSound, the dual front stereo speaker setup (the speakers come with built-in amps) and Beats Audio support. Recording in videos is clearer with an HDR microphone. HTC One price and release date: is it the One? HTC has really improved every important aspect of the phone’s experience with the HTC One. At first sight, it is an absolutely brilliant phone with a gorgeous design. But last year HTC had a similarly brilliant One X as its flagship (truth is it had sub-par battery life), with a best-in-class screen and a beautiful design, and it still couldn’t make a dent in the Samsung-Apple duopoly. The HTC One will be released in March on a whopping 185 carriers in over 80 markets. In the United States it will launch on AT&T, Sprint and T-Mobile, with Verizon notably missing from that list. And this year, HTC will hopefully market the new One enough to give it a chance against Samsung and Apple. How do you like the new HTC One? more information on HTC BlinkFeed’s content partners, visit the HTC Blog. photos and videos set to music with professionally designed cuts, transitions and effects. shared on social networks, email and other services. panorama, time sequencing and object removal. you’re listening to your favorite music, watching a YouTube video or playing a game. and quality in noisy environments so that conversations come through loud and clear. premium design with breakthrough build quality. reduces glare, whilst offering incredible 468ppi resolution and rich, natural colours. information and to pre-register for the new HTC One, visit www.htc.com. Telstra, Vodafone Australia, Vodafone New Zealand. Exchange (TWSE: 2498). For more information, please visit www.htc.com. It's a beautiful phone. I'll take this aluminum body over some cheap plastic any day. I hope the new sense is a major improvement, it is certainly...strange compare to other UI's. The specs are all there, now we just need to see it perform. Agreed, and while I would have liked the screen to take up a bigger portion of the front of the phone (lots of extra bezel), the aluminum design is sturdy and it's territory that HTC has been successful with. I personally prefer the One X's design and polycarbonate material, but if Samsung's GSIV looks anything like the GSIII than HTC will continue to make better built/looking phones. and all boxes ticked, which they repeatedly fail to do, the most obvious being lack of SD expandable memory. not everyone needs or wants an sd card if we can purchase larger options. when i worked in a Sprint Tech center most customers didnt even know they had a memory card. if the design of the GS4 comes anywhere close to looking as good as this i'd be shocked. the plasticky s3 was horrible and looked like a piece of crap, but no one ever mentioned that. Says the guy with a Samsung phone for an avatar. Stop being a fanboy just because Samsung doesn't have the best phone right now. OMG.......I just saw a short hands-on on youtube......... quite franky I wasn't expecting that it would be that slim...nicely done HTC. Only the battery hurdle remains crossing ....All the best ! Xperia Z for me still. Enjoy the washed out phone when anything else gets wet. Unfortunately now that I think about it, wouldn't someone just buy a Windows Phone if they wanted the new Sense UI? You buy Android to experience Android, why would they change it so drastically and seemingly similar to WP? And who ever said it was like wp? Every reviewer that posted that it had live tiles....which, if you didn't know, is a Windows Phone thing. Go on to PhoneArena's hands-on with the HTC One that they just posted and you'll see this quote: Come to think of it, HTC BlinkFeed replaces the typical Sense homescreen we’re used to seeing with a very live tiled one instead. So yes, it does reminds us of Windows Phone a lot. Nuff said. EDIT: The live tile thing is actually a part of the main UI, not the gallery. Weird huh? I would have preferred stock Android Jelly Bean, a real shame. Actually blinkfeed acts like a widget, and you are allowed to have other homescreens. So....gives you an option? Yeah I think that brings the best of both worlds. Why do people need more than 64 GB of storage? Though you're right about the large bezel, I do like the speakers on the front. 64 GB doesn't have to be expensive. On AT&T in the US, the One X+ has 64 GB of storage and costs as much as any other flagship device, and much less than a 64 GB iPhone 5. Storage is actually relatively cheap, it's just some manufacturers (Apple) like to make tons of profit and overprice it.